Let's cook-up some tasty fun to celebrate your young chef’s BIG day! Make your child’s next birthday party awesomely unique and truly tasty with a Sticky Fingers Cooking birthday party! All parties are two and one-half hours long and packed full of amazing ‘cool’inary adventure and delicious fun! Each birthday party has theme, a craft and game to play that is connected to the recipe theme of the party. FUN!! Our party themes also offer an optional team food challenge for older children. The team food challenges include: making special pastry shapes, creating different sauces from scratch and/or adding different vegetable/fruit add-ins and combiations to recipes to WIN a grand prize title. Oodles of Asian Noodles Party! Mix it Up Mac and Cheese Pasta Party! The Pie's the Limit Party! We take care of all of the details! We provide you with one of our AMAZING Chef/Instructors, all set-up and clean-up, all of the awesome kid-sized cooking equipment and tools, fun chef hat crafts for each child to decorate and take home, and colorful personalized recipe cards for each child to take home )for future family cooking fun). The birthday child will also receive a personalized Sticky Fingers Cooking chef apron, embroidered with your child's name. 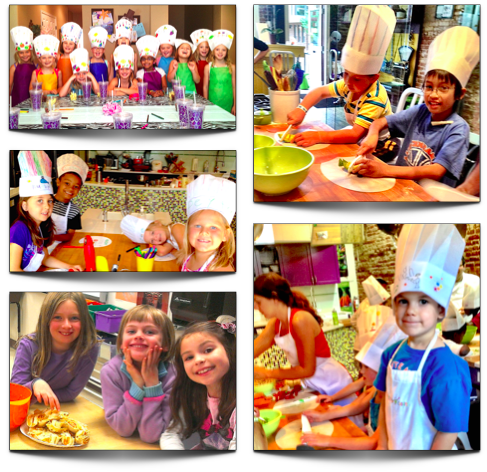 Our in-home Birthday Parties: Available in Denver/Boulder, CO, Austin, TX and Chicago, IL: Parents provide the food items to be cooked in the recipes, as well as the birthday cake / cupcakes - Sticky Fingers Cooking provides a complete food shopping list for the birthday recipe your child chooses. Your child will need to make their own food choices to make their own birthday recipes 100% their own! FUN! Plus ALL of the set-up and clean-up. A memorable birthday party that’s a blast for all ages!